Pump higher, faster and stronger with Verder UK! At the recent World Athletics Championships, Great Britain and Northern Ireland achieved a respectable seventh place with six gold medals. Among the cheerleaders at Verder UK HQ was our very own Marathon Man – who you can see pictured on our home page. His strong red heart acts as a metaphor for the role the pump plays in a system. 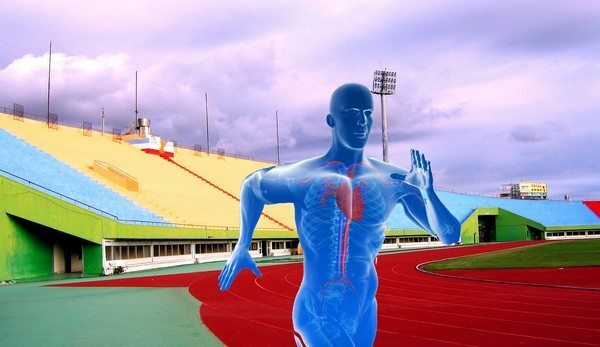 The idea behind Marathon Man is that a healthy pump can be the difference between a effective system and one prone to failure – as this video from Daily Motion.com explains. Picture the scene: The Marathon Man and the rest of his ‘Passion for Pumps’ Verder service team would make a dramatic appearance at the opening ceremony. As each team parades around the stadium, waving their national banners, he would be flying the flag (excuse the pun – Ed) for world-class engineering. This year the 100 metres was all about Usain Bolt, sealing his place in World Championships history, and for me he embodies the essence of power and pace that the event is all about. In my mind, the Verderair drum pump, for super-quick transfer applications, compares to the 100 metre dash, where you need power in short bursts. A drum pump is generally an air-driven diaphragm pump that transfers a fixed amount of liquid from point A to point B. It will very quickly empty a container of all kind of chemicals, including acids, using only compressed air to move the diaphragm. It can run dry and does not require a liquid to operate once a container is emptied, because there are no moving parts that require lubrication from the liquid itself. We’re not saying that it can empty a drum in a record 9.58 seconds , however a Verderair drum pump can transfer corrosive, viscous and abrasive fluids with ease. Athletics fans might be aware of Australian athlete Kim Mickie, who refers to her most powerful throws as the boom tactic. When she brings this strategy into play she is going for power, power and more power! The Verderpro progressive cavity pump is perhaps Verder’s equivalent of the boom tactic. It’s used to produce high pressure in a compact unit – not unlike the performance of Mickie’s life, which won her gold last week. The pump is generally found moving slurries and thick, viscous products long distances. It has a range of options, with different pump inlets to suit various applications, featuring food grade versions, macerators and more. There is also a submersible version and an option for pumping paper mash from recycled paper. The Verderflex VF peristaltic pump is one of our flagship units and also my favourite athletics comparison. It reminds me of the pole vault, thanks to its ability to pump a fluid to a great height above its own level. Our 125mm inlet version can theoretically pump up to 150 metres in the air! The unit benefits from self priming – turn it on and it will start rotating and draw in suction as the rotor hits the tube, producing enormous suction and enormous discharge. Again, it can run dry because the pump has no moving parts that need lubrication from the liquid. Furthermore, Verderflex VF is reversible; allowing rotor blades to run backwards to empty blockages. It has many different hose options and will handle acids and chemicals as well as highly abrasive material. When our imaginary championships draw to a close, the final camera shots might show these three pumps arriving on the podium to receive contracts and customer plaudits in lieu of gold, silver and bronze medals. But back in reality, the team here at Verder want to congratulate all the nations that took part in the real World Athletics Championships this summer. And remember, Marathon Man is on hand to help keep the pump at the heart of your system healthy.